Cold Steel, Inc. is company known for making high quality knives and related products. The company was established in 1980 and they have been creating and producing the sharpest and strongest knives in the entire world. In the past three decades, the company has been the front runner of several innovations that have provided assistance in defining the industry of knife making as a whole. The company has been the subject of progressive development and accomplishments like the handle called checked Kraton and the blade style called American Tanto. These features have gone from stimulating features to becoming a hallmark in the industry in terms of sophistication and quality. Features such as San Mai III and “Tri-Ad Lock” mechanism of lock are introduced. 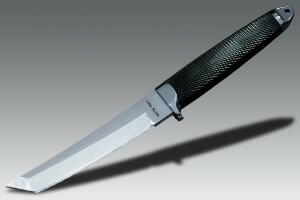 One of the prime examples of the high quality craftsmanship of Cold Steel is their Cold Steel Master Tanto. This knife was invented as well as popularized by the company since they began and since then, this knife has been the cornerstone when it comes to piercing, cutting and slashing power. This knife can become a good tactical weapon as well as an outdoor survival tool (but not fully dedicated as a survival tool). Being a tactical weapon, those who are in the authority such as police, army and other forces can have this superior knife at hand. Of course, common person can also carry this around as part of their protection, but they must carry it with caution simply because it is a “weapon” that can inflict damage not only to the target, but also to the person holding it. As stated earlier, it is not fully designed as a survival type of knife or tool. There are many reasons why it is not a survival tool in the wild that will be discussed later; however, carrying this kind of knife from Cold Steel is far much better than having a foldable knife or worse, having no knife at all. Logically, this is just a knife and carrying it in the wilderness or outdoor is necessary. What makes the Cold Steel Master Tanto Knife a superior knife and a great tactical weapon? Its features include the overall length of 11 ½ inches with the American version of the Tanto blade that measures about six inches in its length. 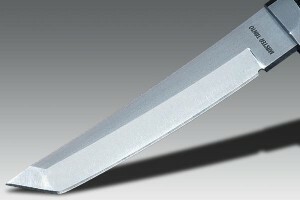 The blade, on the other hand is created using the 3/16 inches VG-1 (V Gold 1) San Mai III stainless steel material. This VG-1 is steel made up of Carbon Molybdenum type of stainless steel. Chemically speaking, this stainless steel is composed of Carbon, Chromium, Molybdenum and Nickel. The forming of double carbide bonds by Molybdenum and Chromium during the steel’s forging gives the steel its powerful resistance against abrasion and corrosion. In addition to that, the VG-1 stainless steel is somewhat one of a kind among the steels used in knives because it is constructed via the lamination of a layer of high and hard carbon and steel between the two layers of tougher yet softer stainless steel. This is opposed to the common process of smelting and forging. Cold Steel has been using VG-1 in many of their knives and the company had observed that this stainless steel has a cumulative characteristic in the field of edge retention, sharpness, shock, strength characteristics and point strength. These blades have an extremely high bevel, which is also hollow ground plus intensely checkered grip called the Kray-Ex™ grip or handle. The knife also has the stainless steel bolster with one quillion. The knife also has finely and durably crafted sheath made from leather. Henceforth, the construction of the knife is the same as, but in the reverse from, the novel Japanese blades that are folded and were made using the core materials of softer stainless steel confined inside the sheath of high carbon steel called the Tamahagane. This kind is deferentially hardened in order to form the so-called Hamon. So, this knife will not only hold a tremendously sharp edge because of the core, which is made from high carbon steel. In addition, this knife is also remarkably tough because of the layers of stainless steel that are laminated and as a result, it is expected that it can withstand the hardest task that a person would usually perform using a dedicated knife for survival. 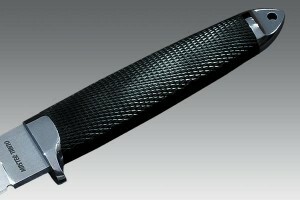 With the presence of the Kray-Ex™ handle or grip, which is in oval shape and reverse taper, the user of the knife will have the ergonomic feel and the positive/easy griping surface in which it will help in the prevention of the knife from slipping or twisting while being use as well as some form of protection for the user. On the other hand, the edge that is straight and long can provide a suitable length if you will use it for carving. It has an acute angle located on the belly of the knife. It also has nearly vertical sweep found at the blade’s tip – unfortunately, this feature is not that useful if you intend to use them in butchering and skinning the game animals you harvested. In addition, the huge ricasso that is found at the back of the blade can minimize the amount of the leverage that the user of the knife can apply to the blade when he/she carves due to it being placed at the back of the edge that is somewhat farther from the hand. This designed made it possible for the increase of the length of the so-called “Moment Arm”. In addition, the solid and tapered steel pommel is another worth mentioning feature of the Tanto knife series. This pommel was designed by Lynn Thompson with the objective of concentrating the entire force of the crushing blow within the small area making a moderately strong blow produce extraordinarily effectiveness in the disarmament or else in making the attacker incapacitated. Given the Cold Steel Master Tanto’s overall features, you can definitely conclude that this knife is an excellent knife for tactical use. If it is intended to be used as a survival tool, it will not be able to produce the best results. What this knife can do is provide some slashing, cutting and piercing power.